After an intense period of heavy snowfall added 12-18" of new snow overnight, we have a HIGH avalanche danger above treeline this morning and a CONSIDERABLE avalanche danger at treeline. A MODERATE danger exists below 1,000' where avalanches occurring from above may run. The new snow fell in conjunction with strong Easterly winds and was deposited on a very weak pre-existing surface. Natural avalanches 1-3' thick have likely been occurring through the night and may persist today. HUMAN TRIGGERED AVALANCHES 1-3' thick WILL BE LIKELY today on slopes steeper than 30 degrees. **Travel in avalanche terrain is not recommended until the snowpack has had time to adjust. Choose mellow terrain and avoid all runnout zones. If skies partially clear, the Alpine avalanche danger will trend to CONSIDERABLE, yet patience is still warranted due to a slow to stabilize snowpack. Today will be a tricky day in the backcountry: It's Saturday after Christmas, many folks may be itching to get out and snowmachine, ski, snowboard, etc., we just had 12-18" of new snow and.... skies may clear up. The problem is, and the tricky part, will be keeping our terrain choices in check since HUMAN TRIGGERED AVALANCHES ARE LIKELY. Not only are we just hours away from a 'rapid loading' event, but all this new snow fell, with wind loading, onto a weak surface. Hence, bonding between the new and old snow is not expected to be quick. Reports from yesterday, just as the storm was ramping up, were that avalanche conditions were rapidly increasing and shooting cracks were seen at treeline. WIND SLABS: With strong Easterly wind overnight and moderate Easterly winds remaining through today, we can expect windloaded slopes to be prime to avalanche. Triggering a wind slab 1-3' thick is likely and these may be triggered remotely from the ridgeline. STORM SLABS: Temperatures increased between 10-15 degrees F during snowfall. This is a perfect set up for an "upside-down" storm; depositing denser snow on top of less dense snow, creating a slab avalanche problem in areas sheltered from the wind. LOOSE SNOW AVALANCHES: Sluffs due to heavy snowfall likely occurred last night and again will be likely today. These have the ability to trigger a slab avalanche on their way down. What this means is very conservative choices are necessary for a safe day, and a safe Christmas weekend, in the backcountry. Choosing to ride your snowmachine in the flats and skiing/snowboarding on slopes 30 degrees or less is recommended. If skies do clear today, or tomorrow for that matter, very careful snowpack assessment is needed before venturing into the steeper and avalanche prone terrain. Cornices are expected to have grown and be teetering on the brink of breaking today. Some of these likely broke off during the night, which in turn is one of the main triggers of naturally occurring avalanches. These may break naturally today, triggering an avalanche below or easily triggered by people on a ridgeline. 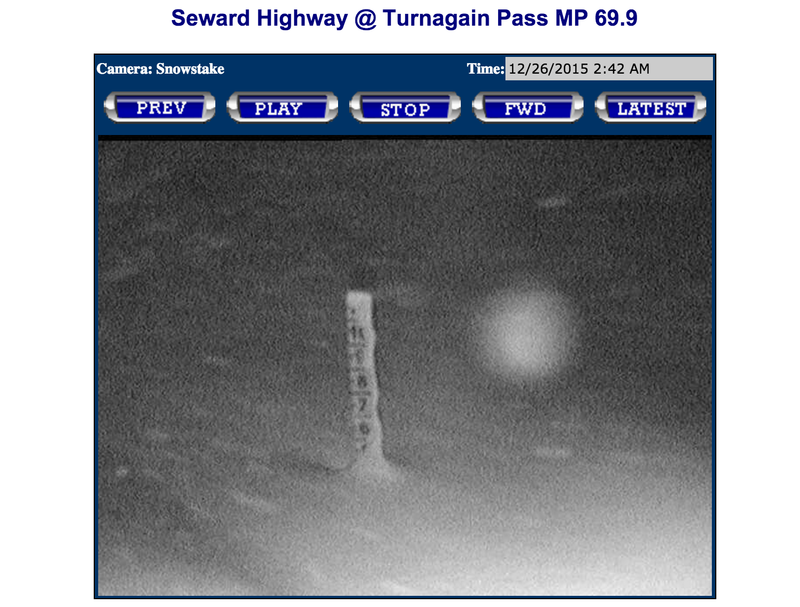 For a look at the rapid loading overnight watch this loop of the Turnagain Pass DOT weather station snow stake! Photo is a still image from 2:42am on December 26th. Light snowfall began yesterday morning along with moderate winds from the East along the ridgetops. Late in the day, snowfall intensified, temperatures warmed ~10F and the Easterly winds began to cranked (averages in the 30 and 40'smph). Additionally, the rain snow line climbed from sea level to ~800' during the day. Snowfall totals at the mid-elevations are in the chart below. Today, the brunt of the storm is through and we will have intermittent snow showers and partly cloudy skies throughout the region. In favored areas another 2-4" of snow is possible. The Easterly winds are expected to be 15-25mph on the ridgetops and temperatures in the low 20's F above treeline and near 30F at 1,000'. Another intense Pacific storm is on track for Monday. Weather models are showing this system bringing the warmest air we have seen yet this season; along with intense precipitation and wind, we should see a rain/snow line between 1,000-2,000'.